The South Pacific’s best option for your tropical vacation. Whether you are looking for a romantic getaway, a honeymoon or an island wedding, An adventure escape filled with snorkeling, scuba diving, fishing, kayaking, white water rafting, hiking, horseback riding, or simply relaxing in a hammock beside a tranquil lagoon. Fiji has something for everyone from private island resorts to resort hotel complexes, from some of the world’s most luxurious to a backpackers retreat. 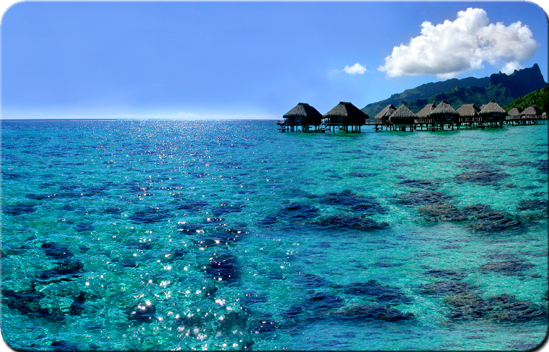 Choose Rarotonga for high mountain peaks from which abundant rainforests cascade to a palm-fringed shore. The island is almost completely encircle by a reef, with a clear turquoise lagoon and white sand beaches. Or choose Aitutaki for it’s crystal azure waters and sparkling white sand beaches. We recommend seeing the islands of Tahiti, Bora Bora, Moorea, Taha’a, Raiatea, & Huahine from a 7 day all-inclusive Paul Gauguin Cruise. The land of epic scenery, powerful landscapes, and incredible cultures and traditions. Premier accommodations and a wide variety of sightseeing choices. Travel New Zealand by escorted tour to get the most value for your time. We also recommend visiting by cruise ship. It is hard to believe that two hundred years ago people were forced to go to Australia ( it was a British penal colony at the time). Australia is the world’s largest island with The Great Barrier Reef, Aboriginal culture and art, Ayers Rock, kangaroos, Tasmania, koalas, the Queensland Rainforest, casinos, Sydney, beaches, the Gold Coast, opera, and the Outback as some of it’s many attractions. Almost everyone will love Australia. It can be seen on an escorted tour or by cruise ship, we highly recommend either to get the most out of your stay.